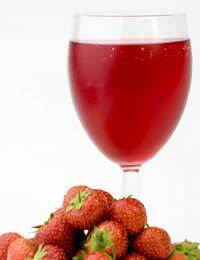 Strawberry Wine is one of the best known and loved English Country wines. It is easy to make and ideal for summer garden parties and picnics. It is not strictly a wine but like other English country wines (see accompanying articles) is made from the fermentation of grown produce – in this case 100% fresh strawberries. Like many other alcoholic beverages, the production of strawberry wine is very simple: left to their own devices most strawberries would naturally ferment. The only issue here is that some ‘bad’ bacteria may enter the fermentation process. Contrary to popular belief, this would not render the resulting alcoholic liquid poisonous – it would merely give it a bad taste. For this reason, the fermentation of strawberries, like grapes, elderflowers, or grapes, must be undertaken in an air sealed vat – which can be bought online as part of a wine ‘starter kit’. Strawberry wine is much maligned by the wine drinking community as a novelty drink, and it is perhaps this attitude which has led to its scarcity. It can be found at a small number of farm shops, and is occasionally produced at home. Strawberry wine does precisely what it says on the label – it has strong hints of strawberry, with a slight acid-alcohol kick to it! One good example of Strawberry Wine is the characteristically light ‘Kellercup’ Sparkling Strawberry Wine produced in Germany. Cornish Berries also produce a Strawberry Wine available on the internet, made by the Polmassick Vineyard, and weighing in at a hefty 14% volume! Curiously, whilst Strawberry Wine is frowned upon, Strawberry beer is making a regular appearance in up-market restaurants and bars across the U.K. as a quality alternative to conventional wines: Surely this marks a good time to be marketing and reintroducing fruit wines into the market! It seems, at the least that the grape does not have the monopoly on the high end dining and drinking experience. Strawberry Wine is popular name for Rock Songs of the 60’s and 70’s, with the first being produced by Mike Wofford in 1966. It is unclear why so many musical acts have recorded sings under this name (some of them covers of others), except to say that the name, like the wine, when consumed in large quantities, conjures up images of beatnik abandon. But then, in all probability, the title is a euphemism for altogether more potent mind changing substances! Strawberry Wine is ideal with dessert (particularly the sweet ‘Cornish Berries’ Strawberry Wine), salads and barbecues. A sparkling strawberry wine is ideally suited for consumption at the beginning of a meal or party – Champagne style. It provides a great talking point and whets the appetite for a first course. Obvious accompaniments for strawberry wine are summer fruits, either as a summer pudding, or alone, fresh fruit served alone, including raspberries, blackberries and strawberries. This latter, served with cream is the ultimate in simplicity, proving that drinks accompaniments need not be over complicated. Alternatively try with Strawberry Jelly dessert, or Strawberry sorbet. I'm with lynn--I used to drink Kellercup in the 80's and I would love to have some now. PLEASE help us find a supplier here in the U.S. !! You mention the German Kellercup Strawberry wine in your article.I used to drink this in the late 70's early 80's and it was absolutely delicious.I have been trying to find a supplier of this wine since 2007.Do you have any idea where I could order this from?